Protesters are challenging the results of the recent election. Iran has instituted restrictions on news media coverage of the protests on the streets of Tehran, making there-live reports indispensable to knowing what is happening. For the 6th day, protesters had a great rally in Tehran’s “Khomeini” square. The silent rally began on 4 PM and at 5:30 “Moosavi” appeared at one corner of this large square on his car. After a few words, the crowd moved to “Enghelab” square in a distance of 9 kilometers. 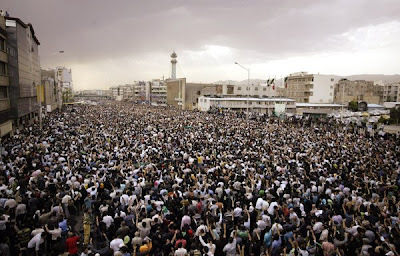 I believe that there were more than 1 million in this rally and this is really great when you notice that it is the 6th day, protesters have no media, there are certain threats and attacks from the governments and there is no hope for a change in governments’ behavior. The Rally ended at 8 PM as there were fears of paramilitary attacks at the darkness of night. The protesters were mostly wearing black for the mourning of those who got killed in the past days. Many of them had candles with them. For tomorrow, all of us will have a holiday! The next rally would be on Saturday, beginning from “Enghelab” square towards “freedom” square. One of the most popular channels in Australia by a 39-year-old shows: Iranians protesting election results in Isfahan Abbasi Square; Basij Militia shooting Iranian people; police and people uniting in Tehran; Iranian ambulances carry the injured; Isfahan university attack on students; Tehran IRIB stage silent protest. An Dutch electrical engineer from Kermanshah, Iran shares his video collection. Mousavi1388's videos are among the most viewed. Two have logged over 300,000 views apiece. Riot in Tehran streets after election day. age 25, UK. Appears to include a 15 part series.